Tolu Adeyemi is a Private Banker serving Morgan Stanley's Wealth Management offices in Washington D.C. and Maryland.Tolu began his career in financial services in 2007 and joined Morgan Stanley in 2018. 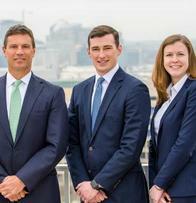 Prior to joining the firm, he was a Senior Client Advisor at PNC Wealth Management. He has also been a Wealth Management Banker and Investment Service Advisor for Merrill Lynch.Tolu received a Bachelor of Science in Marketing from Kean University. He and his wife reside in Washington D.C. When not in the office, Tolu enjoys playing golf, fishing and cooking, as well as spending time with family and friends.